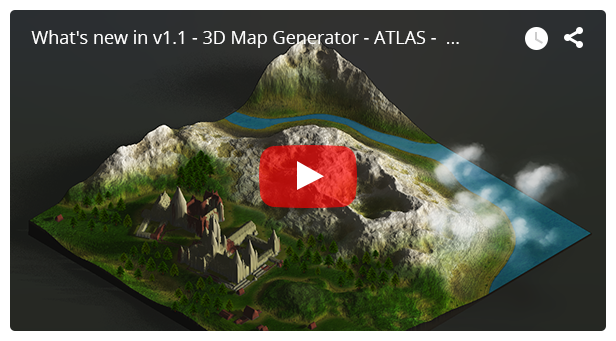 Atlas generates 3D maps from every heightmap within minutes. You need no 3D knowledge or Photoshop knowledge at all. Heightmaps can be easily created with the plugin internal tools or downloaded with the help of the Heightmapper from almost every place of the world. Every angle of vision on the 3D map is possible. You can completely determine the height and map dimension and change it at any time. Also light and shadows are adjustable at will. 8 isometric map angle presets picture a 360 degree angle of vision. So the isometric icon sets will still match the final maps. Manually the map can of course be rotated steplessly. With the map reset function you can go back to the isometric basic setting at any time. Non-destructive creating process: The original grayscale heightmap document remains unchanged. With the free online Heightmap browsers grayscale heightmaps from almost every place on earth can be downloaded and used for your 3D maps. Without any doubt the Heightmapper is the most easy to handle Heightmap source, because with the help of GPS coordinates (latitude and longitude) google map textures can easily be transferred pixel accurately to the 3D maps. The available heighmaps for most areas have a maximum zoom factor of 14z-15z. This is approximately equal to a height of 5,000m – 7,000m. Additionally to the Tangram Heightmapper there are also two alternative heightmap ressources available. The 3D Earth is a 2200 px sized, high resolution 3D model of the earth with real heights and geographical correct textures and data. It can be rotated in every position and is fully editable. Turn it, modify the light and use the integrated textures to change the surface. The additional textures and elements can be turned on and off easily and will be transferred to the globe surface automatically. The additional textures are: clouds, continents shape, boundaries, equator and night view with city lights. Almost every tool of the plugin (except Map Height, Map Dimension and Reset Light) can be used with the 3D Earth: Rotate it in 8 steps with 45° at a time around the own axis. Use the Gradients Presets, Textures and Auto-Textures to design your own surfaces and new illustrations of the earth. Of course it is also possible to use the Grid Tool (e.g. 200 or 400px Grid) or the Contour Lines Tool. A suitable background will make the 3D Earth a real eye-catcher. You can create a new 3D Earth as often as you want. In the Map Library you can archive your own heightmap/texture sets. They can be consitently used as a template or saved as an intermediate result. If an item of the library shoul be updated, it just hast o be saved with the same name after editing and will be replaced automatically. In the same easy way an item can be deleted from the library at any time. Additionally there are also some example maps available for download (see link in the included instructions PDF), that can easily be uploaded into the library. You can use them to just give it a try and see how a heightmap with texture and shape is built. With the help of the Resize Doc funtion an existing heightmap can be enlarged with just one click. You can choose from 3 steps: 1,5x (150%), 2x(200%) und 3 (300%). If there is a texture layer (or group) with the name „texture“ available, the existing texture will be sharpened automatically and complemented with an additional editable adjustment layer. With more than 60 heightmap brushes you can easily „paint“ your own heightmaps. With the help of the Grayscale Tool there will be stamped different high and low objects onto the surface, depending on the intensity of the grayscale. Beside several mountain and canyon brushes there are also a lot of building brushes available, you can „paint“ streets of houses or even whole 3D cities with. If you want to create your own heightmap, the presets of the Auto-Heightmap generator are a good basis. From 7 different presets you can generate quite different random surfaces, that can be edited with the heightmap brushes afterwards. It can be quite challenging to draw a simple flat area into a heightmap (e.g. waters or building areas). With the Add-Level feature this is done with just one click. With the map reminder function Atlas knows even on the next day, how big your generated 3D map is, what height it has and in which isometric angle it’s positioned (The plugin does not remember manually map settings). 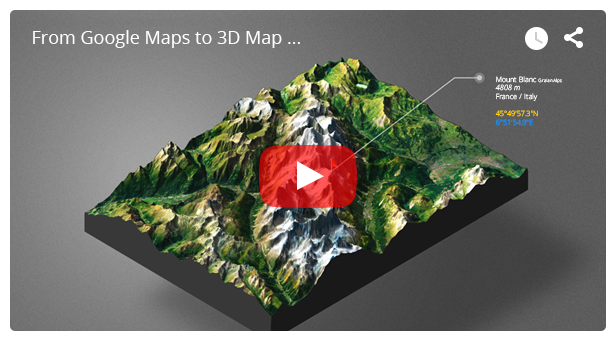 The 3D maps (not the isometric icons) can be printed with your own 3D printer or a 3D printing service. 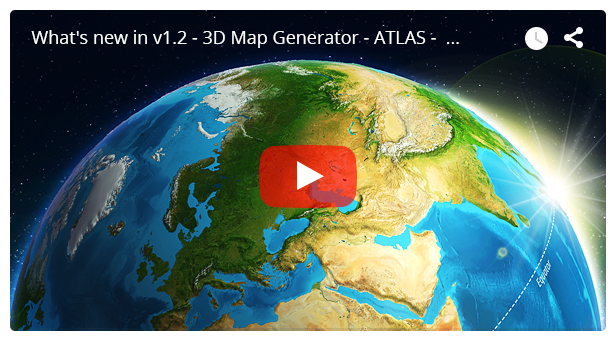 The 3D Map Generator – Atlas plugin will only work in the english version of Photoshop CC-2015.5 or newer. It cannot be installed with any previous version. 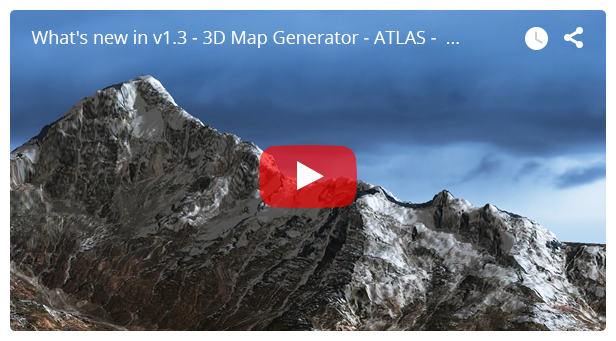 Creating a 3D map with the 3D Map Generator – Atlas can take 10 min or more, depending on the map size and the performance of your computer. 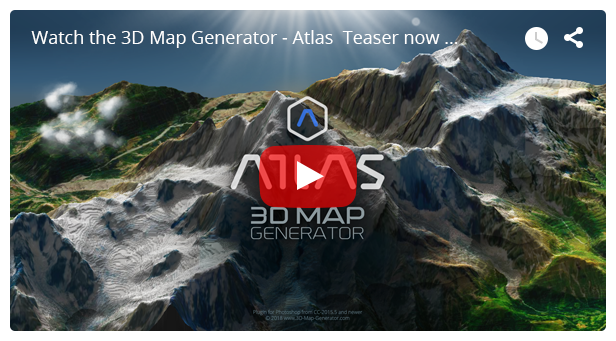 The 3D Map Generator – Atlas can be used on both PC and Mac. Please mind the minimum requirements for performance. Generally every map size until a heightmap size of 6000×6000 px is possible. But the processing time and the map size depends on the performance and the hard-disk space of your computer. All provided textures and brushes are optimized on a basic shape or grayscale heightmap size of 1000×1000 up to 1500×1500 px. *Grayscale Heightmap services: All suggested heightmap services are not part of the 3D Map Generator – Atlas. They are just options for getting a grayscale heightmap. There is no guarantee of availability or functionality.